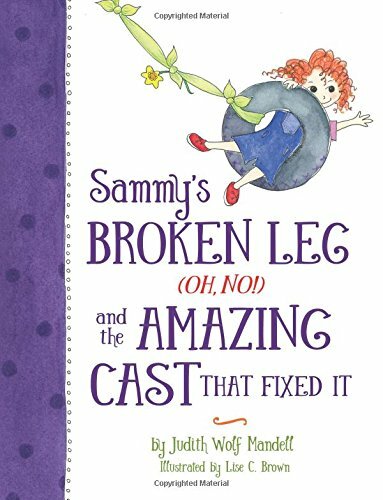 The whimsical book is for glum, grumpy kids in a clunky cast for a broken arm or leg, or to fix hip dysplasia. 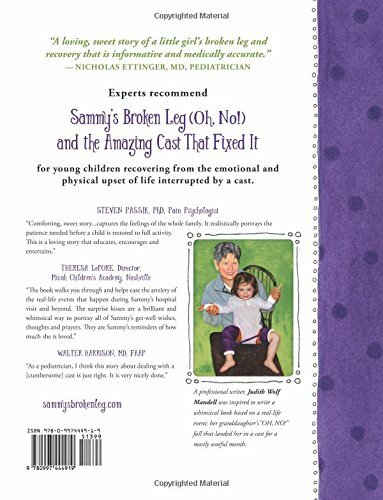 Created by grandmother/author Judith Wolf Mandell, and illustrated by Lise C. Brown, the book was inspired by her granddaughter’s mostly miserable month in a spica (chest-to-ankle) cast to heal a broken thigh bone (femur) when she was 2. Mandell vowed to create a book that would be entertaining, encouraging and educational. gives kids a secret source of patience and power, a troupe of kisses that cheer Sammy on as the days slog by. How and when The Kisses whoosh into her life will amuse and amaze. More at www.SammysBrokenLeg.com, or go to Amazon. Meet Sammy: An hour ago she was fine. Then an “Oh, No!” fall broke her thigh bone. Hours later she woke to find herself in a purple fiberglass cast from her chest to her ankle. It’s the same kind of cast used to treat children whose hips didn’t grow right (hip dysplasia). Sammy’s life has turned topsy-turvy. She’s sidelined from her favorite play, cast care is a bother, the days drag on. She becomes sad, angry, frustrated. It looks like an ordinary huge purple cast, but it’s not. It’s amazing because it’s brimful of kisses who cheer for Sammy and coach her to be patient. The Kisses are Sammy’s secret; only she can hear their whispers. ONE KISS FOR A BOO-BOO. A BAZILLION KISSES FOR A CAST!